An orthotic is a custom made arch support device that is fabricated out of a plaster mold we make of your feet. It serves to control the abnormal motion that can cause the pain in our feet. Dr. Peng prescribes this device for conditions like plantar fasciitis, arch pain, neuromas, flat feet, high arched feet, and many other diagnoses. There are 2 types of procedures Dr. Peng can do to relieve the pain and inflammation from an ingrown toenail. Both procedures, under a local anesthetic block, remove the offending sides of the nail that is causing the problem. The first procedure is called an avulsion, which removes the side of the nail temporarily allowing it to grow back. The other procedure is called a matrixectomy, which removes the side of the nail permanently so it doesn’t grow back. When you have a consultation with Dr. Peng, he will decide which procedure will be best for you. Plantar warts are stubborn painful lesions that can appear anywhere on the foot or ankle. They can be small or large and often look raised with surrounding callus and small black dots inside. If you pick at them, they often bleed. Many times Dr. Peng is able to treat these lesions with powerful topical cream applications. Surgical excision is only used as a last resort. Many times other skin lesions can look like a wart but is not. If you don’t know what it is, make an appointment with Dr. Peng for a consultation. Ankle sprains are common injuries associated with sports and high impact activities. This is when the ankle is forcibly rolled in or out causing immediate pain, swelling, and bruising. These injuries need to be evaluated urgently to allow proper healing to occur. Treatments might include an x-ray and immobilization by a cast or walking boot. We have same day appointments available for these types of injuries. Please call us to be evaluated by Dr. Peng. PRP is an acronym that is short for platelet rich plasma. We draw a small amount of your own blood and spin it down here in the office. The plasma portion, which contains the platelets, is re-injected back into your body in the chronically injured area. It is these platelets that help heal the injured area. PRP is mostly used in chronic conditions such as plantar fasciitis, Achilles tendonitis, as well as other soft tissue injuries. Please contact Dr. Peng to see if PRP could be a beneficial treatment option for you. 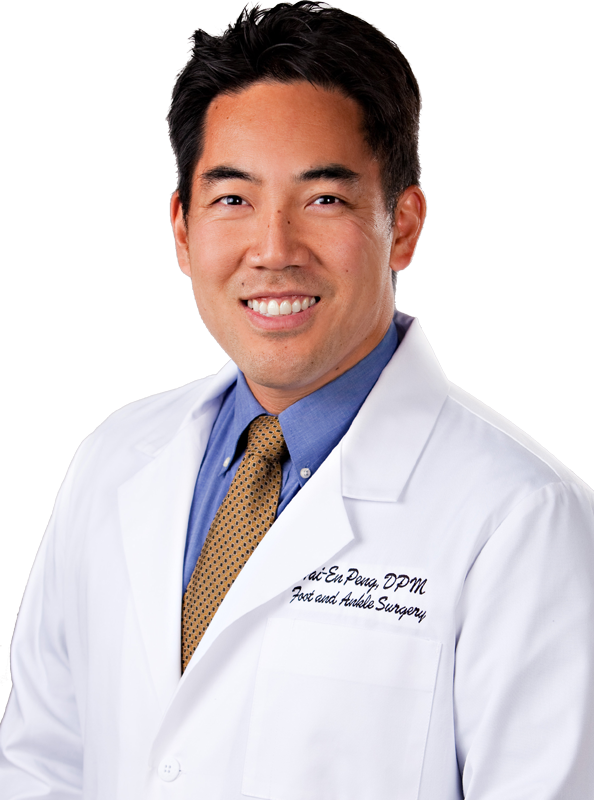 Dr. Peng is very skilled in all aspects of foot and ankle surgery. Surgery is always a last resort option after all conservative efforts have been exhausted. Surgery for the foot and ankle is done to correct bony and soft tissue deformities that cause pain and discomfort. These deformities include but not limited to bunions, hammertoes, cysts, soft tissue masses, spurs, and fractures of the foot and ankle. If you have a deformity that is keeping you from enjoying your activities, make an appointment with Dr. Peng to discuss your options. "I've always believed in exhausting conservative treatment over surgery. Over the years in practice, I've kept many people out of the operating room. Even then, the patients who have been taken to surgery are extremely pleased with their results. I will do all I can to get you moving again...without pain or discomfort!" ©2019 Align Foot & Ankle Center. All Rights Reserved.